Meg is a native of Connecticut where she raised three children and worked as a secretary and office manager. She has been involved with art organizations for many years, including being a charter member of the Society of Creative Arts of Newtown. She vacationed in Eastham, where she developed a love for Cape Cod. She and her husband moved to Eastham in 1984, and a year later, she joined the Eastham Painters Guild. Favorite subjects for her canvases include architecture, fishing boats, harbors, children, flowers, and the natural beauty of New England. Since moving to the Cape, Meg has entered many juried shows, winning a variety of awards. She has been a partner and exhibitor in many galleries. 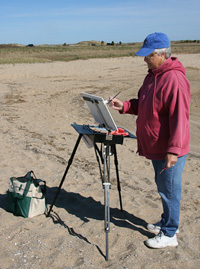 Meg is a members of the Plein Air Painters of Cape Cod and exhibits at the outdoor shows of the Eastham Painters Guild. Her paintings of the Eastham Windmill, the Penniman House, and Nauset Light were used for the covers of the 1995, 1996, and 2000 Eastham Guide books.